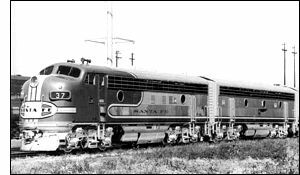 These highly successful diesel-electric locomotives were manufactured by the Electro-Motive Division of General Motors; the F7s were produced from 1949 to 1953, and the F9s from 1953 to 1960. The F7 was the single most popular locomotive in its class, and saw use in both freight and passenger service on well over fifty railroads in North America. Trix's model is correctly referred to as an F7 in their catalog, whereas Aurora inexplicably changed it to F9, which is incorrect. That said, the main difference between the two is the pattern of smaller grilles along the side between the porthole windows. Dummy diesels are cosmetically identical to their powered counterparts; refer to the F9-A and F9-B pages for images. The Pennsylvania F9-B, to my knowledge, wasn't released in a powered version. *The Pennsylvania F9-B was only available as a dummy. Note that they include the road codes, but not the road names.